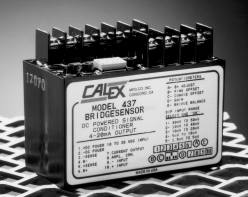 The Model 436 is a self contained, current output, DC powered signal conditioner for bridge type instrumentation. It contains a precision differential amplifier with filtered output and a highly regulated, low noise, adjustable output bridge excitation source. The Model 436 contains an isolated DC/DC converter which operates off 10 to 36 Volts DC. The unit is completely encapsulated for use in rugged environments. Features ! Complete Strain Gage Bridge Signal Conditioner ! 4-20 mA or 12 ±8mA Output ! Contains Isolated DC/DC Converter ! Use with 0.5mV/V to 10mV/V Sensors ! Drives Four 350 ohm Bridges at 10 Volts ! Rugged Epoxy Encapsulated Design.